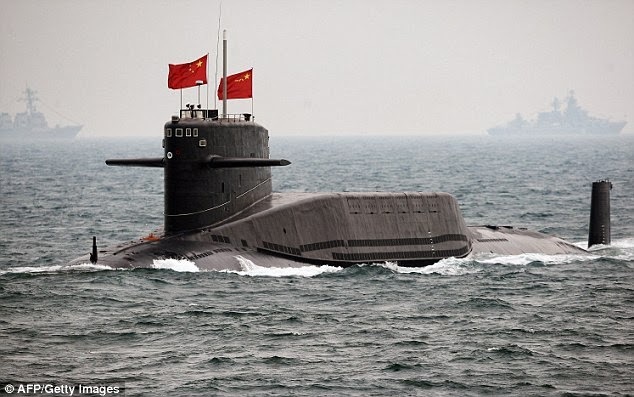 State-run media claims the Chinese military has missiles capable of hitting cities all across the U.S. China’s submarine fleet currently is on ‘routine patrol.’ According to Chinese media, this is the first time China has possessed ‘effective underwater nuclear deterrence against the United States’. Chinese news agencies also reported on the Army’s lethal intentions should it ever use the nuclear weapons the submarines are capable of launching. ‘Because the Midwest states of the U.S. are sparsely populated, in order to increase the lethality, [our] nuclear attacks should mainly target the key cities on the West Coast of the United States, such as Seattle, Los Angeles, San Francisco and San Diego,’ the Global Times said. ‘The 12 JL-2 nuclear warheads carried by one single Type 094 SSBN can kill and wound 5 million to 12 million Americans. But West Coast cities aren’t the only metropolitan areas in the U.S. that face the threat of a nuclear attack from the Chinese, according to the country’s state-run media. ‘If we launch our DF 31A ICBMs over the North Pole, we can easily destroy a whole list of metropolises on the East Coast and the New England region of the U.S., including Annapolis, Philadelphia, New York, Boston, Portland, Baltimore and Norfolk, whose population accounts for about one-eighth of America’s total residents,’ the Global Times said.